Royalty of the Elves, Highborn are rumoredly the result of crossbreeding dragons and elves. Highborn are the royals of the Elven race, and when the king dies, there is a tournament between the highborn to see who is worthy to be the next king. Often snobbish and crude, Highborn are bred like nobility, spoiled rotten. Sometimes, however, Highborn garner a new outlook on life, some even sponsoring Lowborn to be Chosen and join their ranks in the High Citadel. Their pompous attitude is normally hated by the Lowborn, but during those rare times that a considerate Highborn visits them, all their hate for the Highborn is washed away like dirt under a clear waterfall. Every Highborn player character must be a member of one of the six noble Highborn families of the Elves. If the Player is a Halfblood, they must belong to either the Darkflame or Drake families. Darkflame: Most prominent of the families and the strongest as well, the Darkflames have won the trials for Kingship for the past six decades. They own lands in the northern parts of the Elvin lands, owning a large portion of Tis'moon and Tl'ler and Nic'erra provinces, to the east near the coast. Crystalsong: Least of the politically inclined families, the Crystalsong prefer to sit back and watch the drama from afar, rather than be embroiled in the internal power struggels of the other Highborn. Owning a considerably less amount of land than the other families, they only own a small estate in the southern hinterlands, near the Niledenia Lake, which also improves their relations with the Jillecai. 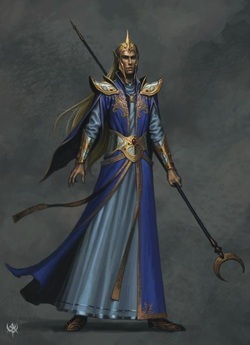 Wavestrider: Preferring to spend time on the open sea, the Wavestrider own most ports in the eastern Elvin Lands, and also controlling much of the naval capabilities of the Elves. Drake: Undoubtedly the most influential, the Drake family has been blessed with enhanced magical abilities from their ancestry, which, like the Darkflames, can be traced back to Queen Whirin herself. The Drakes and the Darkflames normally clash over land, using small private armies in their skirmishes. Fyreborn: Rumoredly a family born of an illegitimate child of one of the later Dragon-Queens, the Fyreborn are the most hot-headed of the noble families, and are the cause of most brawls in the High Citadel. They love to fight, and most Fyreborn join the Rangers at an early age. Scaleblade: Wardens of the Elvin lands, the Scaleblade family settles land disputes and manages the lands for each noble family, never taking any for itself. The Scaleblades have never wanted the crown, they instead act as advisers and assistants to the King and Queen.